What happens after the successful completion of my IVA? The completion certificate issued to you upon closure of your IVA is proof that you have completed your IVA successfully and you keep this in a safe place as you may need it in the future. The Insolvency Service register will be updated and your details will be removed. Please note that this can take up to three months for the register to be updated. These companies will provide you with your current credit report. It is probably best to wait a couple of months following the completion of your IVA to ensure that your creditors have updated their own internal records as well as external records as this can take some time. Your credit report can be obtained online or by post for as little as £2.00. You should check that the latest date of any default registered is no later than the date of the approval of your IVA. If you notice any defaults incorrectly dated you can use our template letter to notify the Data Controller of that creditor of the incorrect information registered. You can find details of the Data Controller by clicking here. Please note that your IVA will show on your credit file for six years from the date it was approved, even if you have completed your IVA early. You should check the start and end dates of the IVA are correct. If you find the dates are not correct for any reason you can send a copy of your completion certificate to the credit reference agencies and that particular creditor requesting that they accurately update the information they hold. The idea behind asking creditors to correct the dates on the default notices and IVA is to make sure that they are removed from the credit file after six years. If your IVA lasted for five years, correctly dated information will be removed from your credit file twelve months after the IVA has been completed. Download our template letter which will assist in cleaning up your credit file once your IVA is complete. 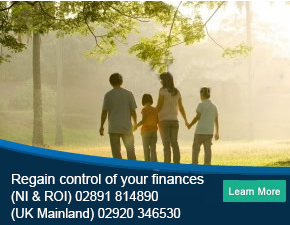 For debt advice or help please Call (NI & ROI) 02891 814890 (UK Mainland) 02920 346530 contact us online. Your credit rating may take some time to improve. You could consider have a contract mobile phone, a pre-paid credit card or a credit card with a small limit which you pay off in full every month. All of these will help you improve your credit rating after the completion of your IVA. Other ways to improve your credit rating include ensuring that you are on the Electoral Register, making creditor payments on time, ensuring that defaults are correctly dated so they fall off after six years, checking that the IVA entry is correctly dated and credit checking yourself regularly to monitor updates. Click on the following link to read our Frequently Asked Questions or call us on (NI & ROI) 02891 814890 (UK Mainland) 02920 346530. Our team are waiting for you to call and help you recover your financial position. Call (NI & ROI) 02891 814890 (UK Mainland) 02920 346530 or click below. You can call us on (NI & ROI) 02891 814890 (UK Mainland) 02920 346530. Alternatively why not use this form and we will be in touch as soon as possible. An IVA allows you to renegotiate the terms of your arrangements with your creditors. If you have unsecured debts with a number of creditors that you are unable to pay this is an alternative to formal bankruptcy. An IVA (Individual Voluntary Arrangement) allows you to manage your debts with a solution that will give your creditors money over a period of time, which is normally 60 months. A debt management plan (DMP) represents a viable alternative to an Individual Voluntary Arrangement for those people struggling to cope with rising levels of debt. A DMP allows individuals to restructure debt repayments into a informal payment plan. Declaring bankruptcy may be a last resort, and you do need to make sure that you have fully considered the process from all angles – the advantages, the disadvantages and the implications. Our experienced personal insolvency team at PJG Recovery can talk to you about all of the solutions available to you, including Debt Relief Orders, Individual Voluntary Arrangements and informal Debt Management. If you live in Scotland and are struggling to repay your debts you may want to consider entering into a Trust Deed with your creditors. A Trust Deed is an alternative to bankruptcy and is a formal agreement between you and your creditors, where you agree to pay an affordable payment each month for a fixed period - usually 3 years - in exchange for your creditors agreeing to write off the balance outstanding at the end of the 3 years. Our advice is always free and we only charge when we start acting on your behalf. Our fees are proportionate to the activity we perform. Fees for IVA's, Bankruptcy and other services do differ, so please review our fee structure so you are aware of how debt assistance works. We have been operating since 2002 and we are a team of professional insolvency practitioners who are passionate about helping you manage issues with your debts. Being in debt is a scary and worrying time for many people. More and more people are getting into debt through no fault of their own and this is where the team at PJG Recovery can really offer you advice and help to become debt free in the best way possible. We are here to help you "recover" from debt and are always happy to talk to you for free on how we can help. » Can you help my business? © 2019 PJG Recovery Limited.